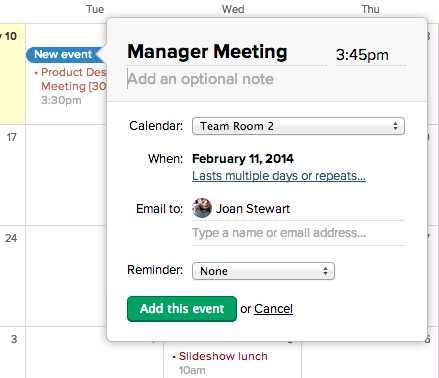 Need to schedule out some meeting room time, but don't want to deal with extra scheduling software? You can use Basecamp 2 for that! 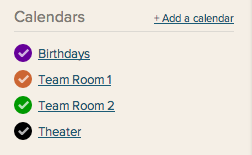 Set up a calendar for each of your rooms. Give 'em all different colors so you can tell them apart and share them with your teams. Schedule your events according to the right room and time. 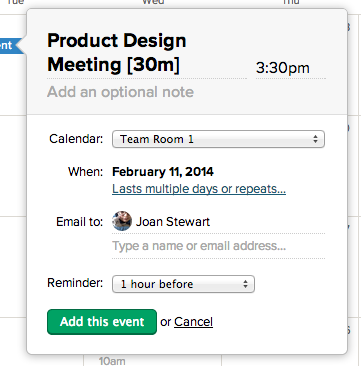 You can also mark your meeting attendees for notification. They'll know exactly when and where the meeting is, and how long it will last. Now that you've got something scheduled and noted how long the meeting will last, everyone else knows when they can use the room!